Kids just need space. Room to move, to play and explore. I attended a great school site visit today and it struck me, that all kids need their schools to have space and freedom to move. All kids. 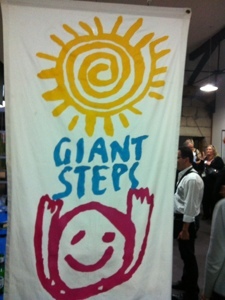 Giant Steps is a school in Sydney for high needs children and young people with autism. It is located in heritage listed buildings on the former asylum on the Parramatta River. Site has beautiful sandstone buildings, not actually purpose built for a school, of any type. The staff and students work in defined spaces with thick sandstone walls, with little possibility for opening them up, due to heritage listing and the sheer cost. The campus, on the Gladesville Psychiatric Hospital, and the site has grown from a single, redundant building to a collection of spaces that educate and support young people from 3 – 18 years of age. We saw a short video of Charlie and how he processed the elements of the end of the day. His exit from the school day included a deviation to jump on the trampoline, because he could. He had freedom to be himself. An independent school, Giant Steps doesn’t charge fees, it receives government funding for about half of the running costs and relies on donations and fundraising for the remaining operational funds. There is a strong community feel, with families pitching in to get the work done. Traditionally special needs schools have been relegated to ‘left over’ space – space that has been gratefully utilised but is often a long way from a purposefully designed environment for high needs students. We heard from the staff about how the design and elements of the physical space impacts on the learning, social and emotional needs of a young person with autism. The purpose of our visit was to see Markaling House, a modest building which was funded through the Building Education Revolution program, the 2009 GFC stimulus program by the Australian Government. This building has been the recipient of a number of architectural awards. The space is a direct result of a true collaboration between the schools staff, parents and architects. Markaling House is a demonstration of how a considered building can become an educative tool. Its use of natural light and indirect light reflecting off the bright yellow walls and ceiling was surprisingly calming. If you could design a school from scratch for your kids, what would it look like? Her answer? Space, for movement, for play, for kids to be kids, openness and freedom. Wide and broad spaces for play and breakout spaces when needed. It would have pods for learning in different ways. Her answer wasn’t much different from any other teacher I might ask. It’s the same for all kids. The floor plate for schools, for all kids, needs to be broad and wide. Resetting the default position from corralling kids and teachers into manageable boxes to supporting freedom, choice and openness. We may just get a calmer, happier schools and interested and engaged students.